The name totally has this 'power' when you pronounce it - RRRango! :D It's an interesting cartoon, but I don't think there's any clear 'message' - or perhaps there is? 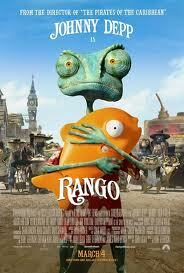 Rango's this lonely lizard who likes drama and impersonating characters. He is originally owned by some young people, but because of an accident he's left on his own in a desert...where he finds another 'home' that he can belong to. Perhaps it's again (like I am Number Four, though the two are really incomparable in so many ways...haha) about 'belonging'? I would say if that's the message indeed then it's a bit too hard for children to grasp...just like in many contemporary cartoons. But that's alright, I think the kids at the screening all enjoyed the film a lot.